Cute Comforters and Bedding Sets! My Favorite Cute Comforter Sets! Cute comforters are also a huge part in a girly woman’s life! We love to always have a cute bedding set in our bedrooms! They are usually pink or any bright color, have hearts, polka dots, butterflies or flowers on it and are very girly! 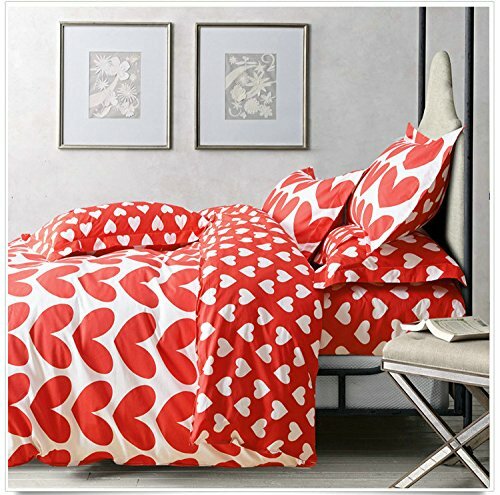 *This is a super cute red hearts bedding set for girly women! Besides being very girly, it’s also very romantic! You will also get the gorgeous pillow cases and the fitted sheet! Makes an awesome gift to any girly woman or girl in the family! The Cutest Bedding Sets for Girls! 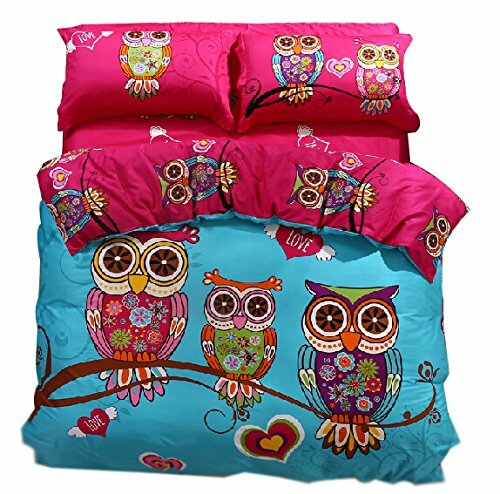 Beautiful and very sweet girly pink and turquoise owls bedding set for the girly woman’s or teen girl’s bedroom! This cute bedding set includes the 2 shams and 1 flat sheet too. Will make a wonderful girly gift to any girl in your family! This is a beautiful and extremely elegant bright colored hot pink and black Safari comforter set! It is perfect for a teenage girl’s bedroom! It’s fun, bright, vibrant, cool and very affordable too! It includes everything you see in the picture, even the cute decorative cushions! Girly buyers said it’s warm, comfy and soft too! 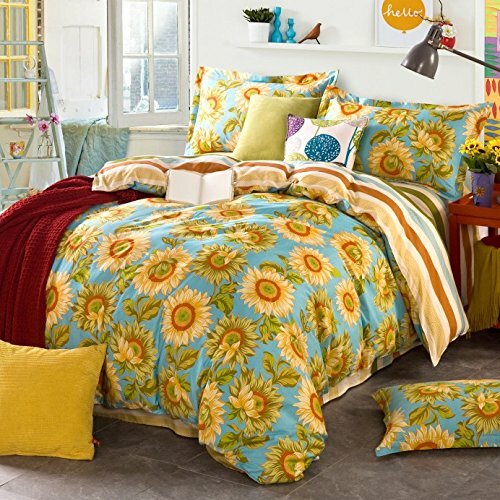 It is actually one of the most beautiful sunflowers bedding set I have ever seen! Will make any girl’s bedroom look so cute!! The color combination is absolutely stunning! It will always make your bedroom look sunny and happy! 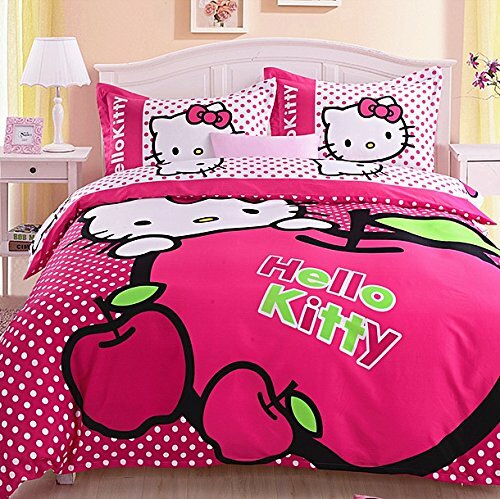 Cutest PINK Hello Kitty Bedding Set for Sale! This is the most adorable pink bedding set I have ever seen! It is a PINK polka dot Hello Kitty bedding set! Hello Kitty comforters are also very cute and girly teen girls love them! This is a very cute and girly Hello Kitty duvet cover set! You will also get the cute Hello Kitty pillow shams and the sheets! 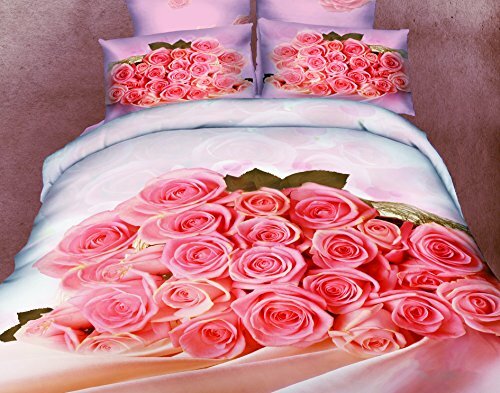 Cute and Girly Romantic Pink Roses Bedding Set! Another extremely cute bedding set! Yes, it also comes with the cute pink roses pillow shams as well! 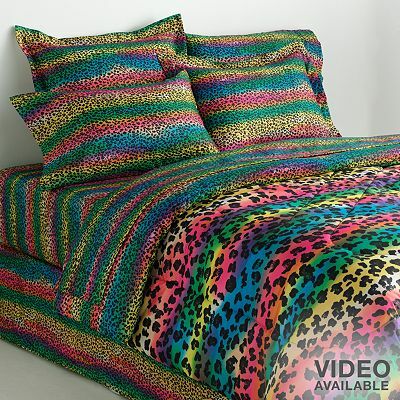 Colorful Rainbow Leopard Comforter Set for Teenage Girls! Cute and Colorful Happy Comforters! What a cute rainbow leopard comforter set for girly women and teenage girls! It’s so adorable and so girly! I love how they combined the rainbow colors with the fun leopard prints! Will definitely cheer up your bedroom! The Most Beautiful Bedding Sets for Women! We cannot think about cute comforters without also thinking about butterfly comforters! 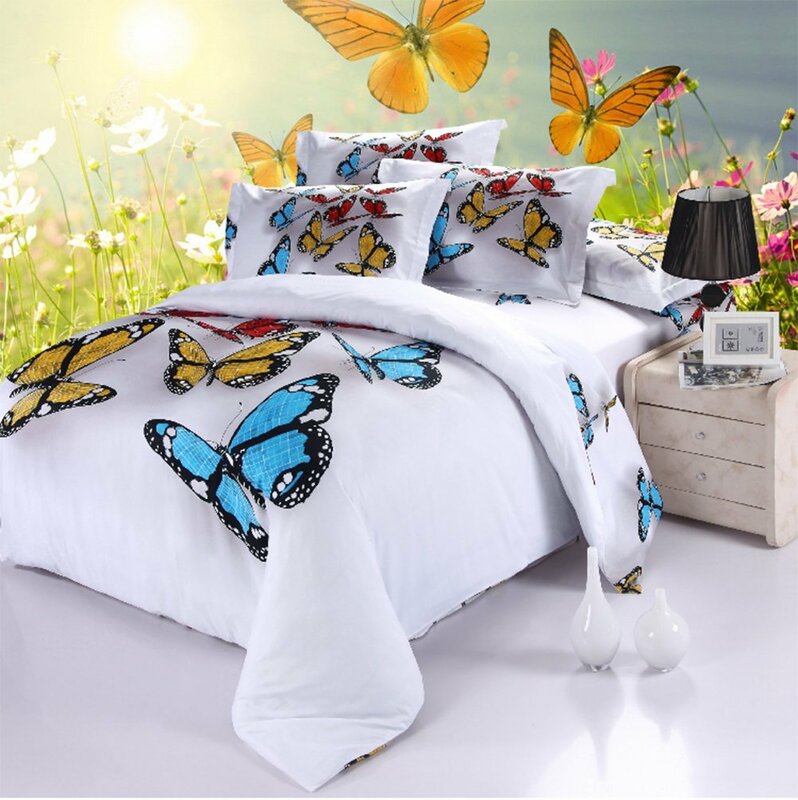 This is a very cute and girly 3d butterfly duvet cover set for girls or girly women! I love everything about this stunning duvet cover set! It is absolutely magical and mesmerizing! Will make everyone go ‘Wow’! when they enter your bedroom! It also includes the beautiful pillow cases and sheets. Cute and colorful butterflies meet some cute and colorful dragonflies on this very cute comforter set! It is made of 100% cotton and it’s absolutely adorable! Happy Pink Floral Comforter Set! 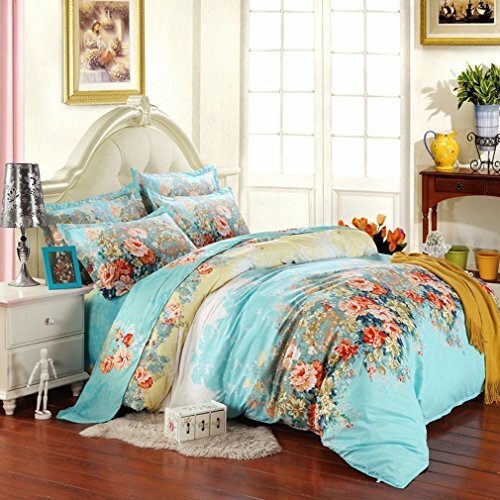 Girly Women Love Cute Floral Comforter Sets! This lovely 100% cute, happy and very colorful cotton floral comforter set is one of the girliest and cutest bedding sets I have ever seen! Look how bright and cheerful it is! Will instantly brighten up your whole bedroom! It also comes with the cute decorative pillows and all the shams! This gorgeous giraffe comforter set is one of the most fun, most bought and cheapest cute comforter sets for girls on the market! Will make your bedroom look just like a fun Safari getaway! It also comes with the fun giraffe neck rolls too! Perfect to create a giraffe bedroom! Just add a cute stuffed giraffe on the bed and maybe some fun giraffe curtains! Fun Girly Bedding Sets for Teen Girls! Cute and Fun Floral Duvet Cover Set for Girly Girls! This fun and colorful cute floral bedding set is one of the loveliest duvet cover sets for girly girls around! Look how cheerful it is! It will make their bedroom look brand-new! 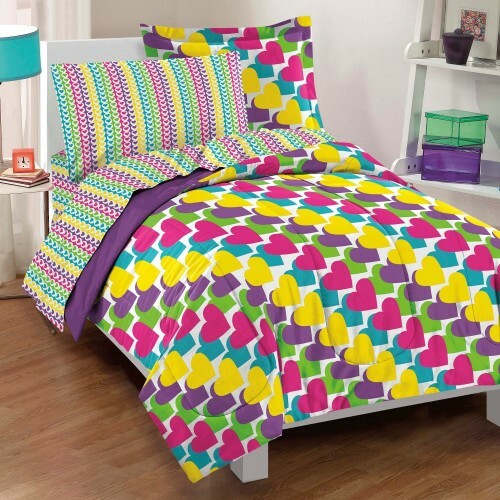 Cute and Colorful RAINBOW Hearts Comforter Set for Teen Girls! How cute and fun is this RAINBOW hearts comforter set for sale? Perfect for a teenage girl’s bedroom! It also includes the cute pillow cases, besides the cute comforter and the cute pillow shams! *Great news fellow girlies: it’s cheap!! Beautiful Blue Pink Yellow Ruffle Bedding Set with Pink Flowers! Have you ever seen a more gorgeous bedding set before? The color combination is stunning and the 3d pink flowers give it a beautiful ‘princess’ touch! It is very delicate, made from cotton and gauze! Perfect for your girly tween girl’s bedroom! Don’t forget to check this site for more cute and girly stuff for girly women!